Store your data safely in the cloud with more choices to meet your data storage needs. IBM Cloud Object Storage offers worldwide locations for your data storage needs with three resiliency options. Cross Region: Your data is stored across three regions within a geography for highest availability and resiliency. Regional: Your data is stored in multiple data center facilities within a single geographic region for best availability and performance. Single Data Center: Your data is stored across multiple devices in a single data center for when data locality matters most. Definition -Multi-regional protection with concurrent regional access. -Multi-site protection within a region with concurrent data center access. -Single Data Center protection and access. -When business continuity across multiple regions is top of mind. -When availability and resiliency are highest priorities. -Best combination of price, performance, and availability. -Recommended over Cross Region for most use cases — application development, analytics, big data, data lakes and low-latency workloads. -This is the default resiliency choice. -When in-country data is a top priority. -When dictated by data locality restrictions. 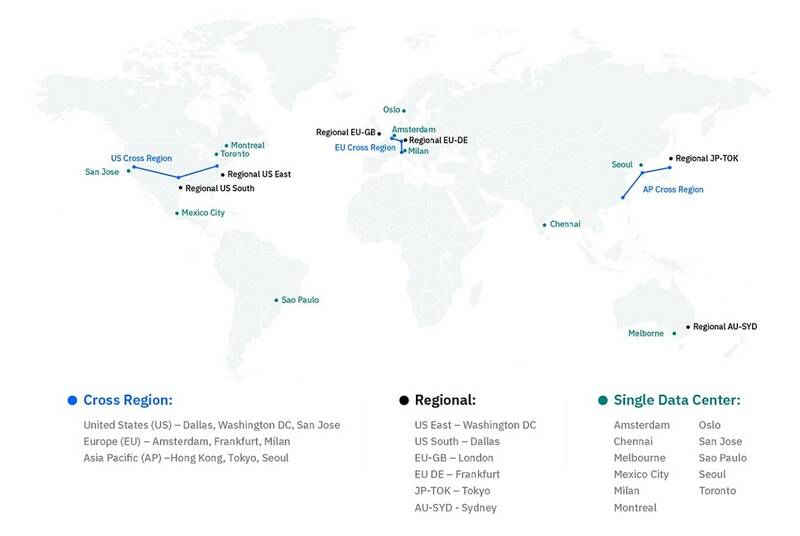 Availability of IBM Cloud service integrations -Not all IBM Cloud service integrations are available to Cross Region. -Regional has the broadest coverage of supported IBM Cloud service integrations. -Not all IBM Cloud service integrations are available to Single Data Center. -Additionally, some services that are available may be hosted outside the region. Protection -Protection against entire regional unavailability or outage. -Protection includes entire site outage but not regional outages. -In the event of a data center level disaster (fire, flooding etc. ), data may be unrecoverable. Customer backup is recommended. Create an IBM Cloud account for free. Get immediate access to an IBM Cloud Object Storage instance and USD 200 credit toward any IBM product or service. Choose the free Lite Plan to get started or the Standard Plan with no minimum fees and pay only for the storage you use.